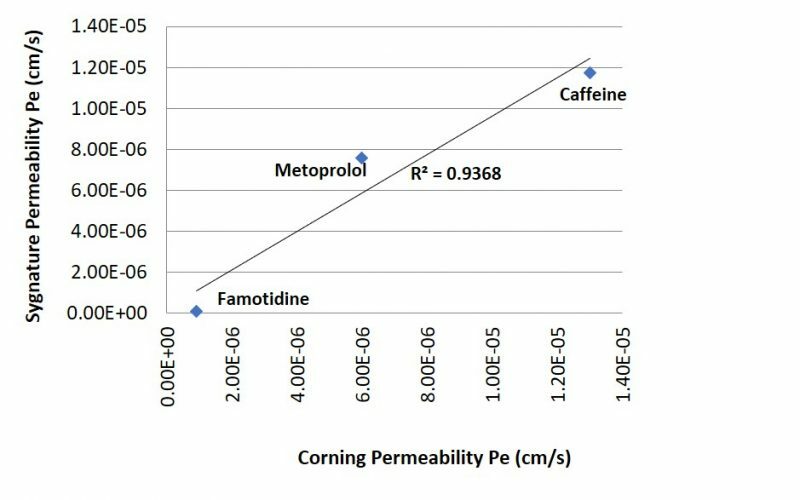 Permeability is an important physicochemical property of a drug, governing the availability of the drug in the systematic circulation. PAMPA measures passive diffusion and is therefore the first port of call when looking into permeability. It also has a higher throughput than Caco-2 or MDCK cell-based permeability assays. The PAMPA assay measures the levels of compound in the donor and acceptor compartments. The drug is placed in the donor compartment and the concentrations are measured in both the acceptor and donor compartments after the incubation. If the drug has diffused across the hydrophobic membrane, it will be detected in the acceptor compartment. Sygnature utilises a pre-made PAMPA pre-coated plate system from Corning. The membrane present is constructed of structured layers of phospholipids to mimic the hydrophobic membrane. This assay has been fully automated and the end point consists of LC-MS/MS readouts. A calibration curve is generated for each compound to which the donor and acceptor concentrations are measured. Caffeine is used as a positive control and Famotidine as a negative control. Figure 1. Sygnature control compound measurements versus literature information from Corning. ‘A Novel Design of Artificial Membrane for Improving the PAMPA Model Application Note 479’. Corning.